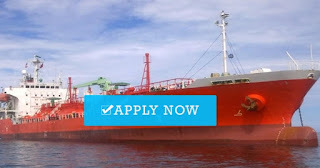 Jubilant Ship Management opening seaman job vacancy hiring master, chief officer, chief engineer, 2nd engineer, electrician for chemical tankers including Aframax and Suezmax / product tanker, bitumen tanker. Unit No. 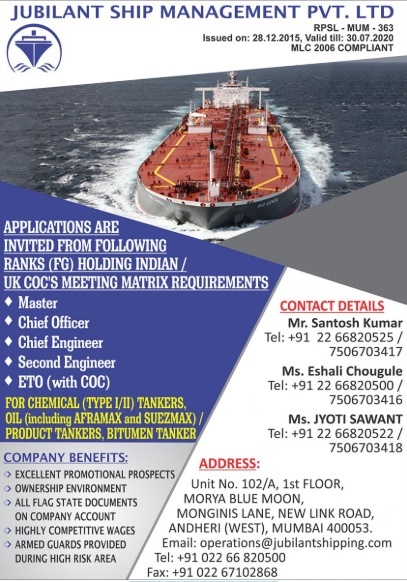 102/A, 1st Floor, Morya Blue Moon, Monginis Lane, New Link Road, Andheri (West), Mumbai 400053. 0 Response to "Hiring Master, C/O, C/E, 2/E, ETO For Tanker Ship"